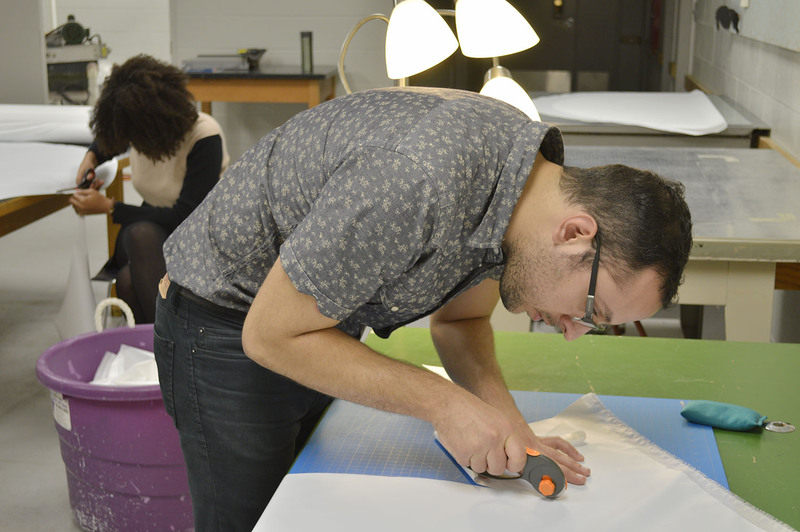 Hello everyone, my name is Fabricio Farías, a BFA student interning at Facility for Arts and Research (FAR). FAR, is a place where I would recommend every student to try and intern at. I have been helping out at FAR for a while now and this semester I decided to go ahead and do my time there for credit. More specifically I have been helping out the Letterpress studio of FAR, known as Small Craft Advisory Press (SCAP). I have been having the pleasure to work with Allison Milham, the press manager, who is always in a great mood and always encourages the interns’ participation no matter how difficult the project. Everyday theres a list of the different projects that we are currently working on. We keep each other updated on the progress. Usually every time we recap the status and progress of the projects and from there we plan out what there is to do for the day. From there its just work, delightful work at that. Since the beginning I set a few goals out for myself. I’ve wanted to learn about the equipment and the different ways the equipment can be taken toward its limits. At FAR right know I have been working on multiple artist books and have been using tools such as the laser cutter, the press bed, and the Vandercook letterpresses to create the different projects. One exciting part of the internship is learning about type and the letterpresses. I hadn’t used a letter press before working at FAR so its been an incredible experience to have the opportunity to tinker with the Vandercooks. My favorite part of the internship is the opportunity to meet the amount of people that I have met. Throughout the time that I have been working at FAR, I have helped out various artists with different types of projects, i.e. artists books and mono prints. The people that I meet and the dialogue that takes place while assisting them in multiple ways makes the time memorable. These are people that are so devout to their work and having the opportunity to pick their brains whether is their artistic processes or their color preferences really makes it hard to put a price tag on such an experience.